I love staying on the west side of Maui. With over 3 miles of beautiful sand and blue ocean waves, Kaanapali beach in my opinion is one of the prettiest beaches you’ll find in Maui. You’ll also find the crescent cove Napili beach here that will give you a fantastic snorkeling experience. Lahaina is also as a resort town since large resorts dominate Kaanapali beach, but I actually prefer an Airbnb accommodation right outside the large resorts for privacy, a gorgeous view and being close enough to walk to nearby restaurants. Yes, it is a tourist town, but because there are so many visitors here, there are that many more activities for you to do and see in this area. 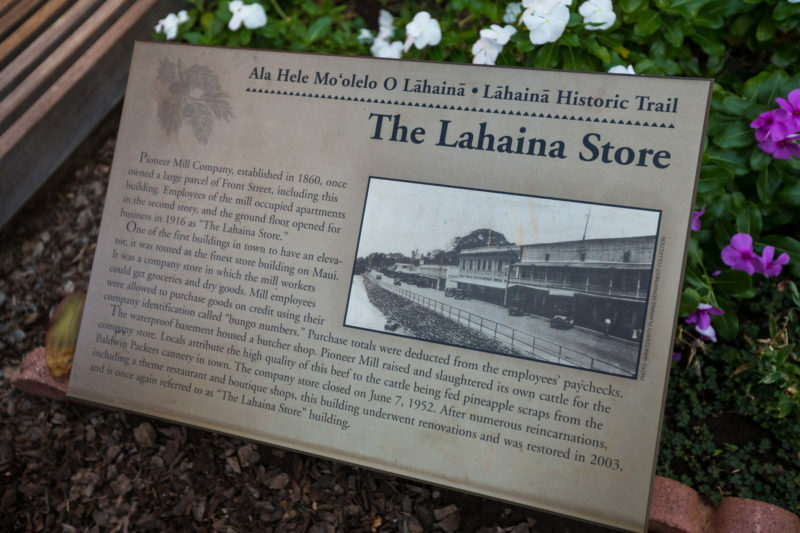 Lahaina has a ton of things to do including learning about history and culture in Maui. While imagining yourself going to the beach everyday seems blissful, realistically you will need to give your skin a rest from the sun. Just walking through Front Street in Lahaina town, you’ll come across several mini museums and the architecture in this Whaler’s village is amazing. There’s nothing like this town on Oahu and I am always eager to walk around and see what I missed since the last time I visited. There are beautiful parks with traditional Hawaiian architecture, but my most favorite part of Lahaina town has got to be the banyan tree. 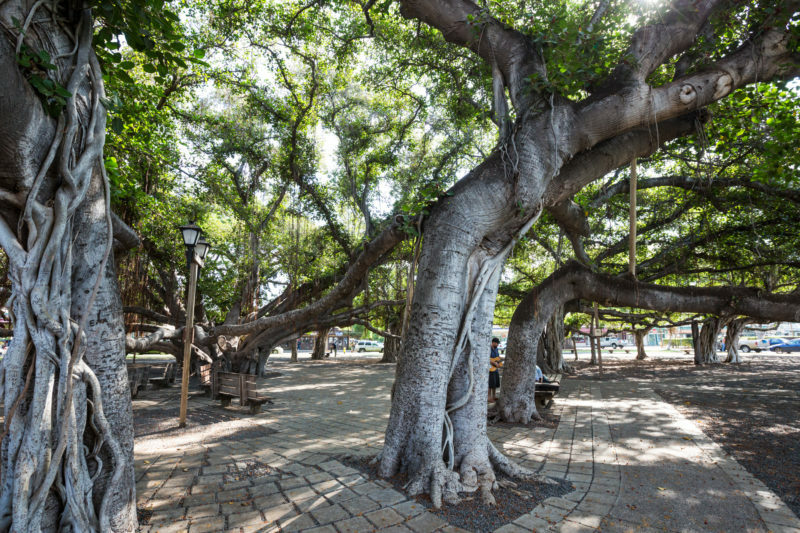 Now don’t be mistaken, this isn’t your average banyan tree. There are plenty of banyan trees on Oahu and the other islands, but this specific tree is on a whole different level. I have tried to take several photos of this tree, but I really can’t do it justice. Believe me when I say that this tree has to be seen in person in order to really appreciate its beauty. My panoramic attempt at Lahaina’s banyan tree. Sunsets are also fantastic here. With a panoramic view of the ocean, you’ll have a colorful ending to each day that includes Lanai and Molokai as backdrops to your sunset viewing. You can even consider an evening boat ride that will let you see the sunset to the West and beautiful Maui to the East. In fact, the Lahaina harbor is right at the edge of Lahaina town so waves are generally smooth in this area for those of you who worry about seasickness. Maui is wonderful. All of the islands are great, but Maui definitely holds a special place in my heart since it’s a mix between my Oahu home and the very country-like Lanai or even Kauai. If you’re still on the fence about staying in Lahaina, here is my local insight about Lahaina town that will hopefully give you an edge in making that decision. Aren’t there a lot of tourists? Yes. The town caters to tourists because of its ideal location and access to a variety of activities both in the ocean and out of it. But the last time I was there, I looked out to the ocean right in front of some popular storefronts and made small talk with a local fisherman who showed me his morning catch of papio. Obviously, there aren’t so many tourists that locals avoid Lahaina. I’m sure you’ve read in several other articles online that Lahaina is crowded. In my opinion, not so much. I live on Oahu where I usually try to stay out of Waikiki and downtown Honolulu in order to avoid traffic. Majority of tourists to Hawaii end up in Oahu, who generally all stay in Waikiki. 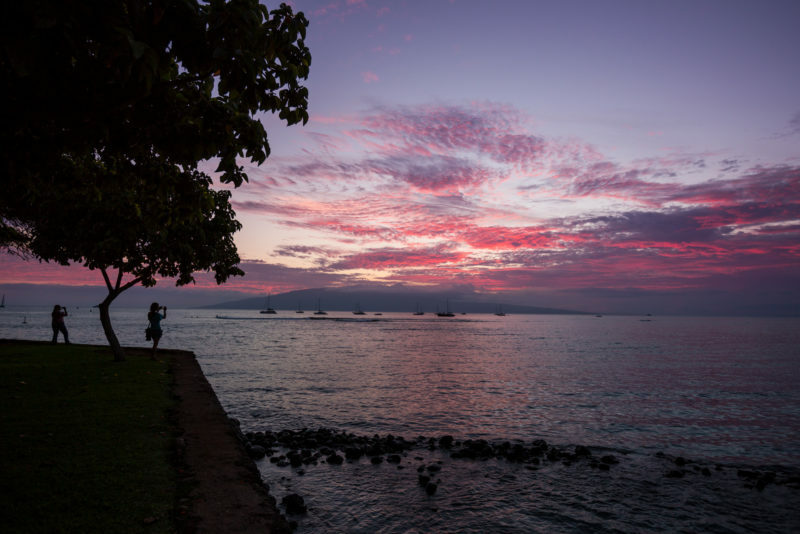 Maui is the 2nd most visited island, but Lahaina is only one of several towns on Maui that draw attraction. The architecture of the area is open and you can meander wherever your slippers take you without running into someone every 5 steps. Even though I live way outside of Waikiki, I feel that Lahaina is “country” enough for me. If you’ve done your research about where to stay in Maui, you’ve probably found out by now that the west side of Maui has a traffic problem. I really don’t think this is too important for tourists. The 2 main big trips out of the west side is going to Haleakala for the sunrise and driving to Hana and back in a day. For both of these trips, you should be out and starting your drive before morning traffic begins. And if you plan to see Haleakala’s sunset or are staying in Hana overnight, then you don’t have to leave until after the morning traffic. 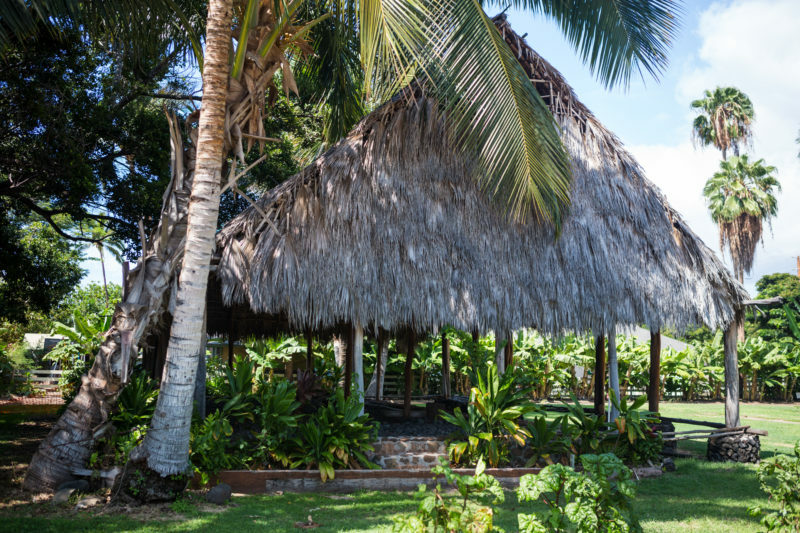 If you’re looking for something touristy to do, the Old Lahaina Luau in Maui is a lot of fun. With all the dancing and food, you’re sure to be well entertained. I always love tours that hit the most famous spots so that I can enjoy the beauty of these amazing places without having to worry about traffic and directions and can just sit and enjoy the view and information the tour guides share. Maui has several famous landmarks and this tour to Haleakala, Iao Valley and Lahaina is an enjoyable one. Don’t miss Maui’s value pass – it includes admission to four of Maui’s attractions at a nice combo price!